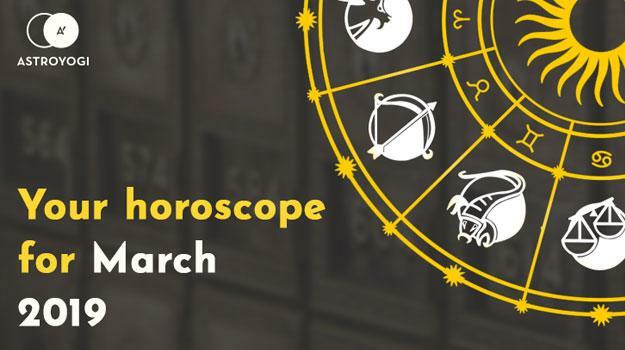 Expert astrologers of Astroyogi give out the monthly horoscope for March 2019. For personalized horoscope analysis and future insights consult our experts online. With the sun remaining in Aquarius, you continue to reap the benefits of heightened self-confidence. This is a great time to complete tasks and projects with zest and zeal and also a wonderful time to initiate new goals that have meant a lot to you but may not have been started due to a sense of it not being the right time. On the 15th, the sun moves into Pisces, creating a time of self-reflection and introversion. You will be more focused on love and romance, rather than goal-setting or work. With Mercury in Pisces, your ability to communicate is softened by your emotions. You may find it difficult to speak without emotion, and your feelings will definitely be an influential force in your life. On the 15th, as Mercury moves into Aquarius, you switch into a more hyper-active state with travel indicated. If part of a couple, you will want to have adventures with your partner. As Venus moves into Aquarius, you will find that your love life takes on an enthralling, kooky air. You may be drawn or attracted to partners who are unconventional, rebellious, aloof or different from your typical or approved type. This relationship may be educational in some way, allowing you to transcend limiting beliefs. On the 22nd, Mars moves into Taurus, where it benefits your income and indicates a desire to promote a harmonious and serene domestic world. You maintain high levels of enthusiasm as we move into the month of March, and this enthusiasm serves you well, guaranteeing that you enjoy yourself regardless of what you are doing. On the 15th, the sun moves into Pisces, suggesting innovative and even dazzling ideas that are financially beneficial if acted upon. If musically or artistically inclined, you may create beautiful and exceptional work. With Mercury in Pisces you enjoy a beneficial financial period and a harmonious life. If a student, you are driven to pursue your studies overseas. On the 15th, Mercury moves into Aquarius which drives you forward in terms of your professional development. You adopt a slow, steady and fixed approach to projects which allows you to complete challenges and projects in a composed manner. You will certainly not get flustered or flounder! On the 29th, Venus moves into Aquarius which draws out warmth, care and love from your partner, and also generates interest in your abilities at work. There is a sense of thinking or acting outside of the box to achieve results. On the 22nd, as Mars moves into your own sign of Taurus, you are driven to be active and to emphasise the qualities of consistency, persistence and dedication. Some may accuse you of being stubborn! Like a raging bull, it is difficult for anyone to deter you from the path you choose to walk. You start this month on a social high. You may have more activities or events booked in than usual and you feel extroverted and charged by the company of others. Your mind is clear and decisive enabling you to make decisions that are forged by love rather than fear. On the 15th, the sun moves into sensitive Pisces, enabling you to get in touch with revolutionary ideas which promise success, growth and transformation in your life. Your love life takes on a mythic and very fulfilling quality – the relationship you have dreamt of may manifest. On the 15th, Mercury moves into Aquarius which suggests a need to be alert to slanderous attempts on your reputation. On the 29th, Venus moves into Aquarius, bestowing upon you a fortunate period in which your desire for romance and spirituality are greatly emphasised. Wherever there is an emphasis we should act, otherwise we will be ignoring some of our most fundamental needs and desires. On the 22nd Mars moves into Taurus, ensuring that you work hard and are appreciated for your efforts. You feel more focused and understand the need to consistently chip away at the goals that matter to you. If a performer, you bring gravitas to any show! Establishing an enduring sense of confidence continues to be a goal of yours. Confidence is the spice that enables us to do all else, and without it we are not able to get far. On the 15th, the sun moves into Pisces which brings some much-needed luck into your life, which will certainly bring relief. A long-standing health condition will begin to improve, and your financial condition will stabilise. At work, competition may be high, but you will endure and succeed. The key with competition is to acknowledge your competitors but to understand that you have something more, a noble sense of tenacity that will get you through! On the 15th, Mercury moves from Pisces into Aquarius, enabling you to be at your best in a professional sense. You may even attract someone romantically who is simply wowed by your charm. On the 29th, Venus moves into Aquarius. You may find that your mind moves in erratic directions. As such, it is best not to make any life-changing decisions until things settle. Nonetheless, it is fun to dream. On the 22nd, Mars moves into Taurus which strengthens your financial situation and brings gusto to a desire for travel or adventure. You may also want to make a new purchase for your home. Relationships need open and honest communication in order to thrive, and you are learning to bypass the limitations of your ego to reach this place. Concentrate on your love life – give more than you take. On the 15th, the sun moves into Pisces, triggering a sense of tension around age and the future. Placate yourself by delving into your spiritual side. Here, you can find a sense of enduring peace. On the 15th, Mercury moves into Aquarius, which urges you to sit up and take stock of your life. Such a placement can be like a lightning bolt, jolting us to act. Such a shock can be alarming, even frightening, but also necessary for us to make changes we may have been ignoring. As such, it is beneficial to think about what you may like to do differently or where you may feel unsatisfied in your life. Asking yourself these big questions will help you to understand where you truly want to be, and how to get there. On the 29th, Venus moves into Aquarius, heightening your ability to make friends and forge romantic allegiances. This is also a time of surprise, someone new may come into your life, you may fall in love or make a big life change. On the 22nd, Mars moves into Taurus, inviting you to take care of your health. Fixed signs can sometimes pursue a course of action whilst ignoring that they are not immortal. You, like all others, need to rest and take care of yourself. Do not see this as a failing. India’s best astrologers are available 24/7 on Astroyogi for online consultation. Your focus remains on love, and on building a relationship with someone who prioritises loyalty, dedicated and respect. You are seeking out someone of good character, not so easily charmed anymore simply by an attractive personality with little substance beneath. On the 15th, the sun moves into Pisces which can trigger misunderstandings between people, especially romantic partners. Pisces can be intangible, vague and surreal – the opposite of plain, open and honest communication. Try to be as direct and authentic as you can to work around this energy. On the 15th, Mercury moves into Aquarius which fortifies you to make the moves you need to make in life, and also gives you the courage and confidence not to be deterred or put off by any obstacles or challenges. On the 29th, Venus moves into Aquarius, and health, exercise and nutrition should be priorities to stand you in good stead. If you can commit to these practices, you will appreciate far better health. On the 22nd, Mars moves into Taurus. Those of you who are single may fall in love and be more willing to commit to relationships. Embrace your inner romantic. In terms of love, you need to avoid clashing egos this month. Remember, ego is the opposite of love. Love is patient, kind and selfless. If your ego defences are operating, you are not behaving from a place of love and may want to re-evaluate how secure you feel in your relationship. On the 15th, the sun moves into Pisces, which improves both your health and love life. Also, on the 15th, Mercury moves into Aquarius, which can trigger erratic thought process and instability. Your mind may lurch from one idea to another, with no real understanding of how to get there. Yoga and meditation will be helpful practices. Taking a step back or temporarily changing your environment may help you to see things far more clearly and improve your perspective of matters. On the 29th, Venus moves into Aquarius suggesting parenthood, fame or some other pivotal life change. There may be tension as you adjust to certain changes, but consider the caterpillar who transforms into the butterfly, change is never painless, but it is powerful. On the 22nd, Mars moves into Taurus. Your confidence level may falter, and you may not seem your usual bright and cheery self. Take some time to take stock of what you need to feel rested and your energy will return. Your focus at work is not diminishing and remains your number one priority. If your career is a vocation or passion of yours, this focus will only intensify. On the 15th, the sun moves into Pisces which lends further magnetism to your already charismatic nature! You may cause quite a stir and garner quite the reaction. In love, be cautious, Pisces may make you susceptible to indulging in illusions or seeing a potential partner through rose-tinted glasses rather than as they really are. On the 15th, Mercury moves into Aquarius inviting you to spend quality time with loved ones. There’s a lovely sense of harmony and pleasantness ensconcing your life that is deeply rewarding. On the 29th, Venus moves into Aquarius suggesting novelty and the arrival of something or someone new. The bond between children and mothers is strengthened. On the 22nd, Mars moves into Taurus which makes you powerfully impactful at work. You will be practically immovable. This ability to impress others may be useful in terms of your future. In love, your confidence and openness may attract a promising partner. You are drawn to youthful, positive energy and may find yourself a beacon of hope and inspiration to those younger than you who need guidance this month. Positions of leadership and/or authority in your community will appeal. On the 15th, the sun moves into Pisces, bestowing you with good luck but also ensuring that you work hard to achieve the glory that is waiting for you. Your personal life continues to be a satisfying and jolly affair. On the 15th, as Mercury moves into Aquarius, you may need to share some worries or anxieties with a trusted confidante. A burden shared is halved, so don’t feel the need to carry problems alone. On the 29th, Venus moves into Aquarius which indicates a need to travel and to take many short trips, dipping your toes into various waters. Relationships blossom with a cordial aspect that encourages friendship, communication and exchange as well as a rampant sense of fun. On the 22nd, Mars moves into Taurus ensuring that you get what you want. You may be more stubborn than usual – less quick to give up an opinion or value. There is also the desire to do something new and different. This week, your health and financial status continue to improve and blossom. Your self-confidence is robust as a result. The only area that you may feel deficient in is love, it may be that your relationships feel unsatisfactory or that your relationship to yourself is lacking in self-acceptance. On the 15th, the sun moves into Pisces which brings out a very enthusiastic energy which you will direct into professional endeavours. It is important that you don’t neglect your own health in doing so. Balance is something that Capricorn’s are forever trying to integrate into their life’s. Although your tenacity and ability to push is admirable, sometimes you need to learn to soften into the moment. Life itself is a paradoxical balance of learning to be impatient and patient at the appropriate times. On the 29th, Venus moves into Aquarius, a position that gives you the perspective to see your life more accurately. This placement will assist you in terms of establishing the balance necessary for happiness. On the 22nd, Mars in Taurus brings love from relatives and siblings and reinforces broken family ties. You will be an active participant in terms of your duties and responsibilities, happy to earn your stripes. As is the case for all air signs, the key to your brilliance and individuality is your ability to think your way out of situations. You truly have a keen and unique mind, and this month your thinking is at an elite level, tinged with the Aquarian flavour of rebellious and uniqueness that marks you out from the crowd. On the 15th, as the sun moves into Pisces, you are inclined towards getting creative romantically. Writing little notes and poems for a loved one will take them by surprise and impress them. You are also keen to explore and get out into the great outdoors. Adventure has your name all over it. On the 15th, Mercury moves into Aquarius which can signal a scattered mind and lack of concentration. If there is something important, a project that needs completing, then it is important that you find a way to recalibrate your tired senses. On the 29th, Venus moves into Aquarius which enables you to successfully resolve serious issues. The women in your life will be an invaluable source of help and guidance. This is a great time for love, which may be elevated to a higher status in your life. On the 22nd, Mars moves into Taurus, and your financial status improves dramatically giving you a greater degree of freedom. You begin this month with a low sense of self-confidence which may make you feel doubtful about what to do with yourself and your trajectory. On the 15th, as the sun moves into your own sign of Pisces, you need to be more cautious of your health. Embracing and maintaining healthful habits will be beneficial, especially if you can apply them consistently. Remember, perseverance is the key to lasting change and health is our greatest wealth. On the 15th, Mercury moves into Aquarius which can trigger distractions and tumultuous feelings in love. Learn to develop coping and communication strategies to assist. On the 29th, Venus moves into Aquarius which may make you feel more laidback than you typically do. With this attitude, you may feel more relaxed about the comings and goings in your life. On the 22nd, Mars moves from Aries to Taurus which puts the spotlight on your love relationships, which feel harmonious, enveloping and warm. You sink into them and feeling deeply fulfilled and connected. You achieve desirable results in practically all areas of your life. What’s not to enjoy?